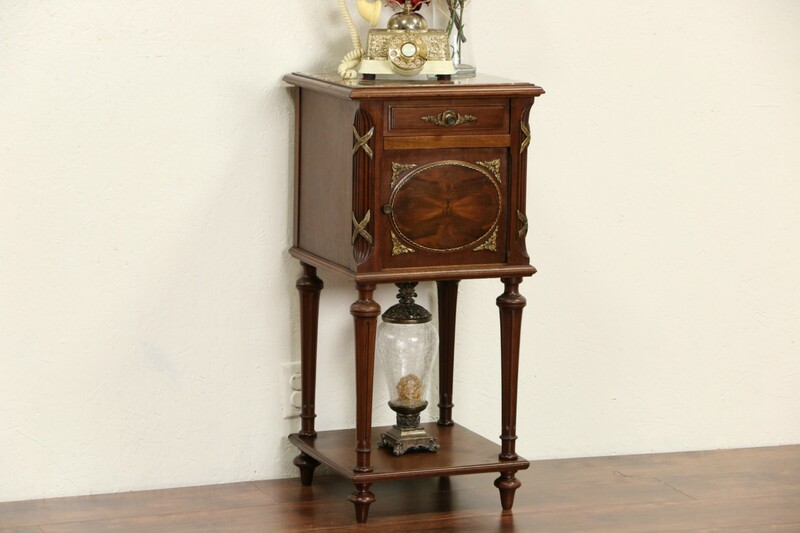 Expertly hand crafted in France about 1900, a classical marble top nightstand is Mahogany with flame burl panels. The original finish is very well preserved and has been waxed and polished, so only an occasional wipe with a soft dry cloth is needed to maintain its warm antique patina. There are minor mars and shrinkage separations plus some warps from age, see photos. Bronze mounts are original on this historic European furniture. Marble on the top of the nightstand has been polished and sealed to resist stains. The lower compartment is marble lined, size is 16" square and 33" tall. Matching piece in photos are prices and sold separately, call or email for availability.